Today's recipe is one of the kid's favourite and of course adult's as well. I feel so lazy to type anything and so before I wind up again let me just hop on to the content.. Puff pastry sheet -- 1 no. Thaw the puff pastry sheets as per the instructions given on the back side of the cover. Trick here is, puff pastry has to be cold and and little thawed at the same time. Mix the cinnamon powder with the sugar and keep it separately in a bowl. Sprinkle generous amount of sugar on the wooden board (or on the working space) and lay down the puff pastry sheet. Roll them to a perfect rectangle. Again sprinkle generous amount of cinnamon sugar on top, run a rolling pin on top of the pastry sheet with cinnamon sugar to get the sugar inside the pastry sheet and help it stay attached. Now tightly roll both sides, left vertical sides and right vertical sides, inward so they meet in the center. (I folded the pastry instead of rolling, to get a heart shaped cookie and folded one more time at last to get one vertical side). Gently press the puff pastry and tightly seal the sheet and refrigerate for 20 minutes or until cold. Later cut the pastry into 1/2 an inch thick slices and place it on a baking sheet lined with parchment paper. 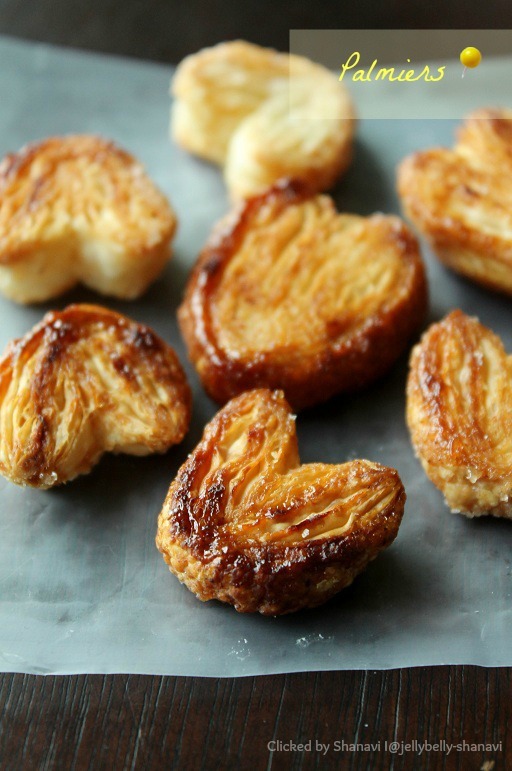 Leave enough space between each palmeir as they will get expand while baking. Bake for 10 to 15 minutes or until golden. 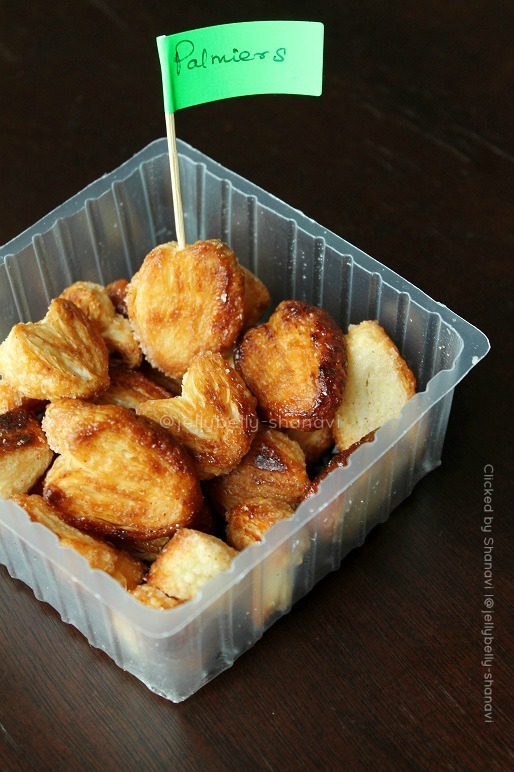 U may also use cocnut along with this cinnamon sugar mixture and try for a change. My sheet was small squares and I kinda made cute lil one's. Use sugar generously, otherwise it will be like eating only puff pastry as I did that reducing the sugar part. Even its my favourite, since it goes for puff pastry sheet am avoiding it to make often..Beautifully baked. wowww looks soo good,my lil one loved it very much,u made it very well!! 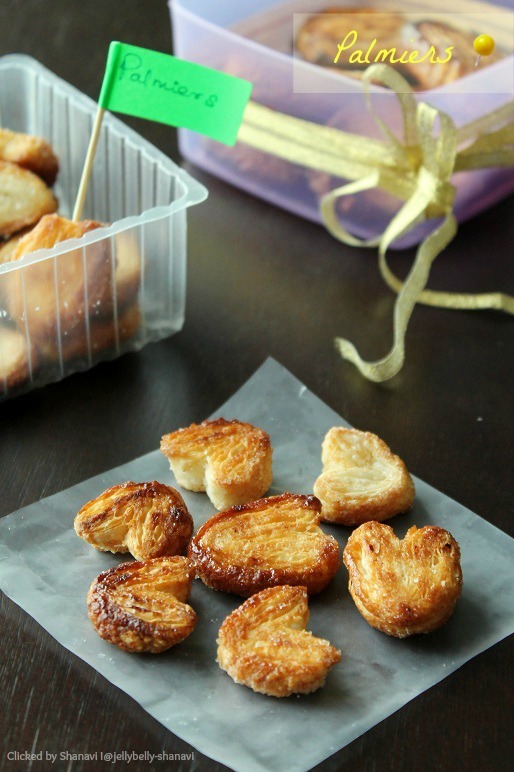 well made dear.. neat presentation..
palmiers looks crunchy and buttery...love it..
Yummy treat both for adults and kids. 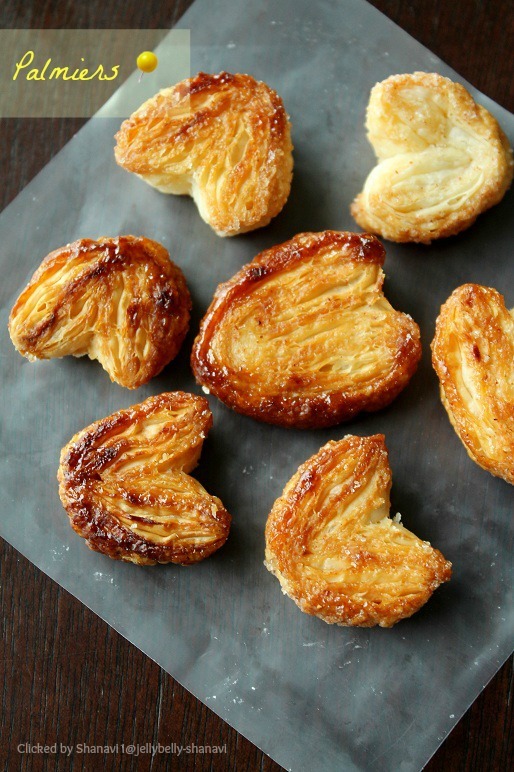 Palmiers were perfectly made. Love all your clicks as usual. Well done Sho. Very cute and well presented.. woow!!! i love it.. once i used to buy this from costco..but recently i stopped buying bcoz i'm putting weight..